I’m excited to endorse my friend Irene Fernando to be Hennepin County Commissioner in District 2. Irene is an experienced leader who has made a difference by purposefully reshaping the status quo, not just challenging it. Irene impressed me when we first met. When she was 17, she co-founded a youth leadership nonprofit which continues to bring qualified young workers to Minnesota — a few have been important players on my staff. Irene’s youth development lens will be valuable to the county’s approach to youth services and job training. Irene's leadership and vision will help shape a positive future for every resident in Hennepin County. Already she has created a nonprofit that has empowered young people to act, she has implemented a framework for corporate leadership development, and she has built powerful and impactful coalitions. Hennepin County needs these skills, this connection with the community and Irene’s irrepressible energy. She will be a valuable addition to the County Board. Irene has a proven track record of creating programs and initiatives that are both people-centric and solution oriented. Her commitment to investing in this country’s future is something we both feel passionately about. From her experience in youth leadership and development, and her desire to invest in transit, bicycle, and pedestrian infrastructure, Irene will be a new and necessary addition to the Commission. I look forward to working with her. I’m excited to endorse Irene Fernando for Hennepin County Commissioner in District 2. As a Freshman at the University of Minnesota, she began her journey to inspire and enrich the lives of young people. She co-founded a youth leadership nonprofit at the age of 17, received a Fellowship from the Bush Foundation, and was named 40 under 40 by a Twin Cities business publication; she has accomplished many things for someone her age. When I first met Irene, it was obvious that she has a bold and refreshing leadership style. Her dedication to bringing out everyone’s inner leader has provided her with a distinct and necessary skill set to achieve accountability and equity in government at the County level. I’m proud to support Irene Fernando’s campaign for Hennepin County Commissioner in District 2. As a former Commissioner, I understand the essential responsibility and urgent need to find affordable housing, assist our homeless and highly-mobile populations, and ensure public transit solutions. Irene’s experience as a leader in the community, in business, and in academia prepare her well for Hennepin County government. I very quickly recognized the incredible energy Irene Fernando brings to the table, and I am enthusiastically endorsing her to be the next Hennepin County Commissioner in District 2. In order to create a government that truly works for all of us, we need representation at every level to reflect the makeup of the cities, counties, and states we serve. I am energized this incredibly accomplished woman of color is choosing to enter the political arena. We need a voice that understands when we don’t explicitly focus on equity, economic and racial disparities increase. Irene will fight for all Hennepin County residents. I’m excited to endorse Irene Fernando to be Hennepin County Commissioner in District 2. Like me, Irene values relationships as the key to collaboration and getting work done. She leads with conviction by understanding the people she serves. She has done this successfully in both the nonprofit world and corporate world, and I think her skills will translate well to public service. I look forward to partnering with Irene to ensure the County’s priorities meet the needs of Golden Valley residents. I am proud to endorse Irene Fernando for Hennepin County Commissioner in District 2. Irene is an experienced and energetic leader who brings forward a much needed vision to serve the community by focusing on racial equity and creating a more accessible government. Irene will work to increase transparency in decision-making and strengthen the County’s ability to connect to our every-day residents and immigrant families. I am excited to partner with Irene to make a big difference in the lives of the people of our city. I am proud to endorse Irene Fernando for Hennepin County Commissioner in District 2. Irene has an amazing energy which she easily spreads to those around her. I’m excited about the future Irene envisions where kids grow up wanting to be a County Commissioner. I share her vision to make the County government more visible and accessible, and I look forward to working with Irene to increase equity and improve the lives of Minnesota residents. I’m excited to endorse Irene Fernando for Hennepin County Commissioner in District 2. Irene has spent her whole life inspiring and engaging young people to action. Her community-focused leadership style is refreshing and much needed in the present and future of DFL politics. I’m delighted to endorse Irene Fernando to be Hennepin County Commissioner in District 2. She and I share the same values when it comes to advocating for inclusion, equity, transparency, and accountability in government. Irene is uniquely positioned, based on her broad range of experiences across sectors, to bring solutions to the Hennepin County Board that center on both people and results. I’m excited to endorse Irene Fernando for Hennepin County Commissioner in District 2. Through her organizing approach, rooted in empathy and access, Irene is building a powerful coalition to govern with. She is bringing new voices and energy into our party—we need leaders like Irene for a truly equitable future. Irene Fernando will be a welcome new voice to the Hennepin County Board! Her experience in both non-profit and corporate sectors prepares her well for a county that is large, complex, and diverse. She is thoughtful, strategic, and highly skilled and will bring a fresh new perspective to this important policy role. One that affects the lives of over a million people. I am personally excited about her candidacy as Hennepin County Commissioner and the possibility of her representing me on the County Board. I am proud to endorse Irene Fernando for Hennepin County Commissioner in District 2. Irene’s vast experience engaging and organizing at the grassroots level makes her uniquely a powerful advocate for local issues at all levels of government. I also strongly share her dedication to improving growth and equity throughout Golden Valley and Hennepin County and I look forward to working with her to ensure the continued success of Hennepin County and all its residents. "I am happy to endorse Irene Fernando for Hennepin County Commissioner in District 2. County government represents an imperative middle ground between city and state. Irene is someone who will ensure that this vital position continues to be productive and responsive to the needs of all residents." 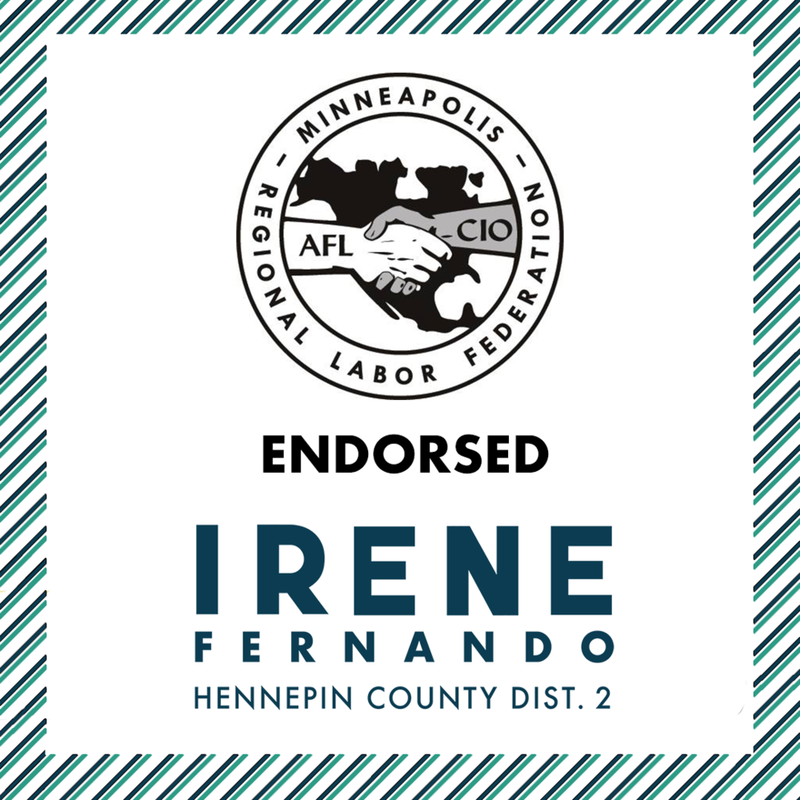 AFSCME Council 5 is proud to endorse Irene Fernando as our candidate for Hennepin County Commissioner in District 2. As an advocate for fairness in government, Irene shares AFSCME's values. She fights for equal opportunity and shares our belief that all working families deserve to be respected and represented fully by their government officials. Irene's emphasis on public health and human services shows her commitment to county residents. Her emphasis on diversity makes her a voice for all. We trust Irene to foster an inclusive and welcoming environment throughout Hennepin County government. Irene will partner with LGBTQ+ community on a whole range of important issues, including ensuring that County social services implement better programs and policies to meet the needs of queer and trans youth. Vote for Irene Fernando by November 6th! "Irene will work to ensure Hennepin County is a partner with our public schools so that families are supported and our students are ready to learn when they come to school. Irene has earned our support because of her progressive priorities. She's a strong supporter of public education and an advocate for worker's rights. The Minneapolis Federation of Teachers, Local 59 endorses Irene and encourages you to vote for her by November 6th!" The Minnesota Young DFL (MYDFL) is proud to endorse Irene Fernando for Hennepin County Commissioner - District 2! Not only is Irene a member of MYDFL, she will be the first person of color to sit on the county board. She has dedicated her life to building power with young people and will take this experience to the county. Irene will make an outstanding commissioner who will center the voices of those most often pushed to the margins. We look forward to working with her to win in November and beyond. "I am proud to vote for Irene Fernando as my next County Commissioner. When I first met Irene last year, I was instantly impressed with her energy, intelligence, and work ethic. She is equipped for the job due to her business background, she leads with her values, and she is willing to build relationships across the board to deliver effective results. Irene will work to ensure more women are represented in politics, and she is inspiring a new generation of leaders in how she campaigns. I am proud to stand with her in this vision, and I hope you will vote Irene Fernando on or before November 6th." At Women Winning we know that electing women isn’t just good for women, it’s good for everyone. Irene Fernando is a leader who builds people up and works to ensure that community is at the center of conversations and decisions, and we are proud to endorse her for Hennepin County Commissioner in District 2. Her experience building coalitions and consensus will be a valuable asset on the County Board. The Minnesota Chapter of the National Association of Social Workers (NASW) is pleased to endorse Irene Fernando for Hennepin County Commissioner - District 2. Irene is committed to working with and advocating for support for both social workers and the clients we serve. We are eager to work with Irene to address critical issues, including access to affordable health care, mental health parity, and funding for prevention initiatives. Please join us in voting for Irene on November 6th. It is with great excitement that I endorse Irene Fernando for Hennepin County Commissioner in District 2. She will advocate for viewpoints that often go unheard on the County level, and I look forward to working with her to strengthen the Northside. Irene’s insight and care will undoubtedly build a more inclusive and progressive Hennepin County. For 60 years, Minnesota Building Trades has been advocating for the rights of workers and the development of construction trade unions while backing the elected officials who support this effort. It is for this reason that we are proud to endorse Irene Fernando for Hennepin County Commissioner in District 2. Irene is an individual who prioritizes infrastructure growth and economic development, while also prioritizing advocating for workers from the perspective of workers. She speaks for the everyday residents of Hennepin County and her voice will undoubtedly prove a positive addition to the Hennepin County Board. Irene is the kind of bold, progressive leader that we need in elected office. We are inspired by her firm commitment to accountability and transparency at all levels of government. Our leaders look forward to working with her to advance an agenda centered on economic justice, racial justice, and affordable housing. We encourage you to vote for Irene Fernando by November 6th! 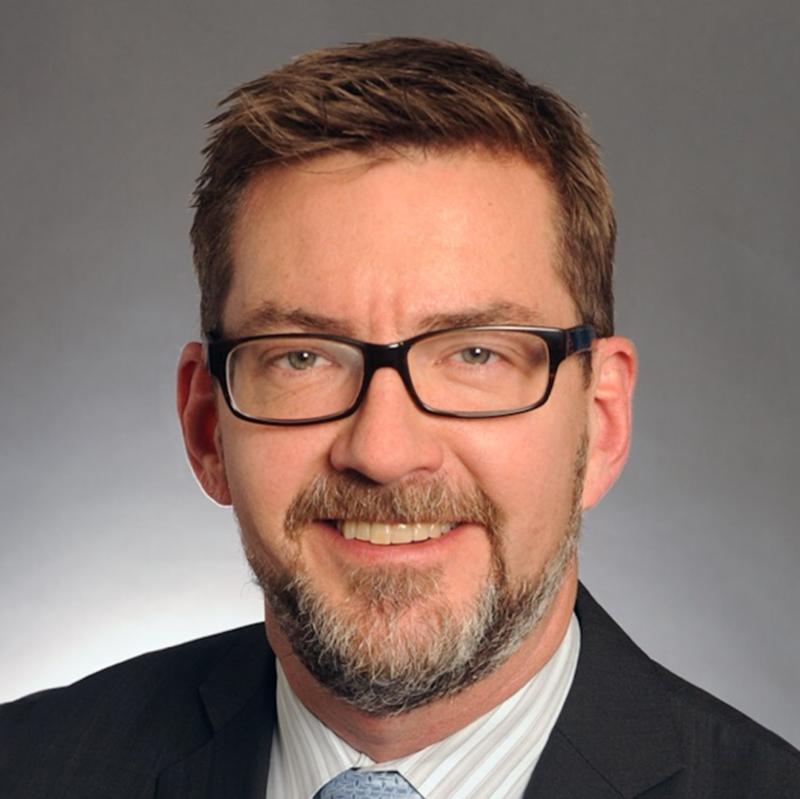 "I believe Irene will bring great passion and a much needed skill-set to the job of District 2 Hennepin County Commissioner. Having a representative that works hard for all parts of the district is key to making sure we have a strong voice at the table representing our needs." "Irene is the kind of leader we need on the Hennepin County Board. She's thoughtful, diligent, and a hard worker. We can trust her to partner with all layers of government and across the district, to amplify all of our voices at the County level. Join me in voting for Irene Fernando by November 6th!"